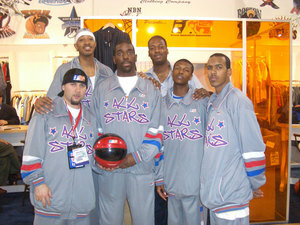 Washington, DC (February 6, 2005) - The Street Basketball Association (SBA) and Nothing But Net (NBN) will unveil the Nothing But Net SBA Line February 14-17, 2005 in Las Vegas at the Magic Show. NBN and SBA wanted to make a big splash into the retail market with the new clothing line, and they will do just that with the Magic Show. With the proper timing and a quality line, stars can be made in the fashion industry at Magic and that is what the SBA & NBN intend to do. The SBA signed a licensing deal with NBN in July 2004 to produce apparel and accessories. 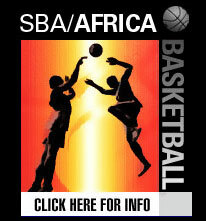 The deal includes rights to produce and manufacture apparel using the likeness of SBA All-star players: Baby Shaq, Silk, Pat Da-Roc, Rodman, and 7 'N� Sum Change. Additional SBA players will have their likeness on apparel in the future. This deal marks the first of its kind in street ball; the deal mirrors one that the NBA, MLB or NFL might receive. The Magic Show is the leader of men�s apparel trade events representing every major market. Offering nearly 700,000 square feet of apparel, footwear and accessories, MAGIC provides a sneak peek of men�s key seasonal trends during its edited runway fashion show. Each February and August, the fashion industry converges on Las Vegas for one of the most influential four days in the business - the MAGIC Marketplace. Seventy years in the making, what started as a small group of manufacturers has developed into the preeminent fashion market in the world.